THIS IS A SPONSORED POST VIA HANDPICKED MEDIA. I feel like I’ve been banging on about the wonders of epilating a lot recently – what with my newly preferred leg de-fuzzing method being mentioned in both my July Favourites and THIS dedicated post. So when I was offered the chance to give away a Philips Satin Perfect epilator to one lucky reader, I thought it was a great idea. Especially since a few readers commented that they would love to try it but didn’t want to shell out for the upfront cost – well now someone will have the chance to try it for free! I can’t talk specifically about the epilator that can be won as I have been using another brand, but I can tell you a bit about my thoughts on epilating in general as a hair removal method and share a few tips that work for any brand. I think for summer it’s ideal (and winter too, come to think of it) – each session is a little more time consuming than the average leg-shaving routine but the time that can be left in-between them makes it worth while. Even when you have left it a little too long (I would say once you are in the epilating routine once a week should be plenty to keep your legs fuzz-free) then the re-growth becomes softer as the hair is being plucked out so re-grows from the root rather than a blunt cut off bit. So you can avoid all the nasty stubble issues that come with shaving. Another plus for summer time epilating – it doesn’t mess up a fake tan. Unlike a razor the epilator skims the surface of the skin just plucking the hairs rather than slicing (that makes me shudder, but you know what I mean) the top layers off along with the hair. So it helps keep a fake (or real) tan nice and even. As I was writing this I also had the thought that epilating in winter might be even easier than summer as it’s even nicer to have baths when it’s cold and leaving a bit longer between de-fuzzing is fine when wrapped under layers. Also – cost wise, epilators are priced at around the £70-80 mark. Which is around the equivalent of a couple of full leg waxes in central London. For a hair removal method that I would say is comparable to waxing in many ways, then the cost actually works out pretty bargainous as the epilator will last a long time and doesn’t get blunt or any other sort of costly maintenance. Plus it wont cost you £40 a go every six or so weeks…. Some of the below tips are from my previous post on epilating, but here they are again in case you missed them. Where possible, do it under the water in the bath (but only with epilators that are suitable for wet/dry use!). At least until you are used to the sensation. If you have a low pain threshold like me, then this is a must. I didn’t manage a full leg out of the water but after trying it in the bath it made a world of difference. If the epilator you are using isn’t suitable for use under water then run a bath for after de-fuzzing to help soothe the skin – but don’t use heavily perfumed bath products as these could irritate. Exfoliate! If you are epilating then regular exfoliation will become essential to avoid dreaded ingrown hairs. So far I have escaped the dreaded ingrowns but without exfoliation this can be a nightmare. Keep the hair short before epilating. Don’t make the mistake I did and think epilating is like waxing and letting hair get a little longer is better. It’s not – it just makes it hurt more. So there we have my two cents about the wonders of epilating. I’m not going to lie – it’s not the most comfortable thing in the world but I can honestly say that the pain/discomfort does reduce as you get used to it. Over the past month or so since I’ve been doing it I have progressed from being unable to finish a whole leg to being able to run the epilator over my legs out of the water and if a wimp like me can do it then I’m sure anyone can. Onto the juicy stuff – what can you win?? Well, there is a Philips Satin Perfect Epilator to give away to one lucky reader! The new Philips Satin Perfect has an extra-wide head which enables it to removes more hair in one stroke, giving you long-lasting smoothness, faster. Its high performance discs are made of textured ceramic material, which gently grip and remove even finest hairs. 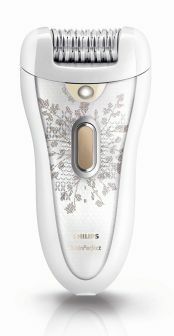 To win the epilator all you need to do is comment below and tell me about a beauty disaster you have had in the past . It doesn’t have to be hair removal related – can be anything. But you have to fess-up to be in with a chance to win. The competition will close at midday (GMT) on Friday 13th August (lucky for some!) and the winner will be picked at random. This competition is only open to those in the UK. Please leave a way for me to contact you in your comment if you win – if the winner does not respond within 24hours of being notified then another winner will be chosen. Any questions please drop me an email (email on the contact me page). THIS IS A SPONSORED POST VIA HANDPICKED MEDIA. To read about my blogging policy in relation to sponsored posts please see the blogging policy page. I had a disaster with a curling iron and one of my best friends. It was one if the brush varieties and I managed to get it stuck in her hair. My dad had to carefully cut it out in the end. Oops. My worst beauty disaster was getting highlights. It was a new hairdresser, I think she knew she’d done something wrong because she sent me home in a shower cap thing with a ‘serum mask’ on my hair telling me to wash it off when I got home. I did as I was told, only to find that when I combed out my shampooed and conditioned hair, large chunks fell out in my hands. Some pieces were breaking off and some were actually falling out from the root. It was awful. I went to another hairdresser for a fix up and ended up with streaky ginger and blonde for 3 months while they repaired the damage in sections and brought me back to my natural brunette. Turns out the powder was two shades too dark because the skin on my hands had tanned more than my face. From now on I’m always testing on my face. The first time I ever shaved my legs was a bit of a disaster! I used a cheap bic razor and ended up removing a 10cm strip of skin from my shin! It wouldn’t stop bleeding! Luckily I got better at it. I went through a ‘goth’ phase when I was a teenager and decided that not only did I want my hair black..I wanted my naturally curly hair pin straight. I therefore decided that dying it black and then chemically relaxing it would be a super idea. It looked great for a day and then all my hair broke off!! I had gone to an expensive hairsalon, and gotten this truely amazing haircut, because I felt like make major changes to my look. So I’d let the stylist cut of well over half my hair and the look was so good. So when the stylist suggested that I such get my eyebrows dyed, I had no reservations. Unluckly for me, it wasn’t my stylist doing the colouring, but a rather new trainee, who went black and grey on my brows, and I’m uber fairskinned and a redhead. Needless to say the end result was faaaaar to harsh for my face, and for a few weeks, I felt like I had two big fat black snails as brows, before the colour faded and went back to their pale selves. I’ve never had my eyebrows coloured again, now I’m religious about brow pencils. my disaster was not too bad – i use an oygen face cream which if u dont wipe off ur eyebrows can turn them blond! and i am asian with black hair lol. you can only imagine my surprise as i watched my brows start to lighten. yes smaira, read the instructions next time! would love to win, my epilator is very old! Ohhhh let me tell you about my worst EVER beauty disater. I was 17. Not long been with Antons dad and he was taking me out to meet his friends. So like all girls, I wanted to look my best.. I had to impress after all. I spent literally ages getting ready, the whole day pampering myself then a good hour or so doing my make up. I looked perfect (if I do say so myself) Just before we was ready to go, I was in the bathroom and spotted the eyelash curlers. “I’ll just give my eyelashes a little curl” I thought to myself. I put the curlers on my eyelashes like you do, held them for about 40 seconds, then took them off, with a very heavy hand and pulled all my eyelashes out with it!!!! Obviously the curlers stuck to my mascara. I was mortified! Run into the bedroom to Matt “omg.. Ive pulled all my eyelashes out!” well he just thought it was hilarious. Then what did I go and do? well I thought to take the emphasis off that eye, I’d just curl my other lashes and make my other eye look pretty. I only did the same friggin thing and pulled out all my eyelashes on my other eye too! I was heartbroke, crying my heart out haha. I had 2 bald eyes, with no lashes and I was going on a big night out to meet Matts friends. All night long, I had to point it out to everyone that I had no eyelashes. I didn’t want people laughing about me behind my back and thinking “wow.. shes a bit strange looking, shes got no eyelashes” so I had to say to everyone that spoke to me “ignore the fact I have no eyelashes, I pulled them all out by mistake” haha. The things we do when were young eh! I used way too much blush on my cheeks and then tried to get rid of it by putting powder over it which made it worse! Then the postman knocked at the door and I had to answer it looking like a clown! I bet he was trying hard not to laugh! I’m so careful when I apply my blush now, i’ll never make that mistake again! hair removal cream. I put it on my face thinking it would work the same – it didnt. I ended up with an awful rash that lasted a good week over about 1/3 of my face! I went to Regis for a Charlotte Church inspried chocolate brown look. I was sooo excited and even payed the extra 30 squidders for a senior stylist….. Well out she came this little scottish lady, all smiles and laughs. She made me feel totally relaxed with my tea and biscuit I sat back and let her work her magic. 20 or so minutes later and a wash at the basin I sat back and waited for the unveiling of my new brown locks…. only to discover my blonde hair had not turned to brown but PURPLE I no bloody PURPLE! The stylist saw my face and immediately began backpeddling…. “it’s such a rich colour” blah blah blah… needless to say being an nw20 I looked dead! Not only was my hair ruined but it cost me £80, young and nieve too scared to complain! sooooo after spending all my allowance on the purple nightmare do, I had no money left to fix it! sooo what bright idea comes to mind? oh I no…. I only went and bought a bleaching kit from tescos! I learnt one lesson……. tint doesn’t cancel tint! I had tango hair! I did finally get it fixed though…. after walking in the peak of summer through my local town with a parker coat wrapped around my head! When I took of the hood in the salon I saw one of the fittest boys I knew! (Getting highlights the poser) He actually asked me if I was naturally ginger! If that isnt a disaster I don’t know what is! I’m the same as Lula, I’ve had an attractive burnt red moustache from hair removing cream before, it lasted for ages and then went flakey as it was healing so I had a dandruff moustache instead. I had to feign illness and stay in the house! My worst beauty disaster was when I first discovered tweezers at about the age of 13. You would think the worst part of overzealous plucking is the constant suprised look you sport in every situation of your life…but actually it’s the dreaded regrowth and as I have quite thick hair, yes even my eyebrows are thicker than my fairer haired friends, the ‘eyebrow stubble’ shall we say is my WORST beauty disaster!! Most of my teenage years were a beauty disaster! Looking back I now realise that I looked more like I had two black eyes and that I had spilt an ink cartridge all over my fingers, than the super hot 14 year old I thought I was! Lesson to self – corresponding eyes and nails do not look good in purple and blue. My major burn from hair removal cream JUST as I was about to go on holiday to LA and America I think, but I had this yukky red rash ALL over my legs, great! Email: goldilocksblogsxoxo@gmail.com. I’ve had a few beauty disasters in my time…the worst is hair related (as so many seem to be!) and involved me applying a blonde home highlighting kit to my already dyed hair. I wanted to get my hair really blonde and left it on for far too long and the result was grey/white hair at the tips as I had completely bleached out any colour. I had an emergency trip to the hairdressers and sat in tears as they applied a darker colour to my hair…which then turned ginger as the pigment didn’t take. The wors beauty trauma I have ever had was not paying attention while shaving. I was on the phone when the rasor slipped and cut me in a VERY sensitive “Area”… if you know what I mean. Lets just say it caused a massive welt and wasnt pretty! Havent done that again and dont plan on it either! mine isnt as extreme as the others but bronzing my face loads and forgetting to do my neck, my face was a completely different colour!